If you are looking for a cover for another type of one-design boat, we may be able to find one for you or work with you to design one for your boat. 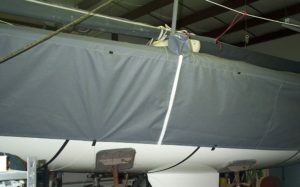 Sail Covers – We build mainsail covers for all types of boats. Our sail covers are built using Sunbrella Acrylic Canvas in a wide variety of colors. Please contact us for color and style availability. For the best fit cover for your mainsail, please take the measurements shown on our Boot cover measurement form and send it to us.